Wow … I can’t believe November is flying by so quickly! Now at the two-thirds point, I’m just about on schedule, even a little ahead if I can keep it up. But just because/if I reach 50,000 words (the NaNoWriMo challenge), before the end of the month, that doesn’t mean I’m going to stop. My plan is to work on this particular story for the entire month. However, the morning of December 1, I have to put it down and resume my edits of the book I’m seriously working on. My daily (okay, who am I kidding? 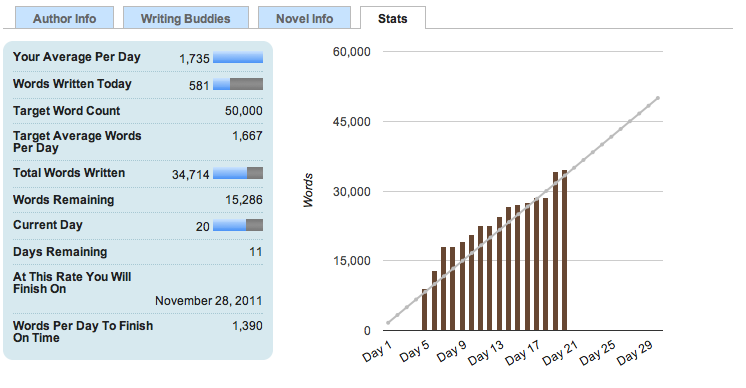 ), my HOURLY obsession is the nanowrimo.org stats page. I update my word count more than I really need to, because it’s fun to see the bars get taller, especially when they rise above the line indication where I should be.